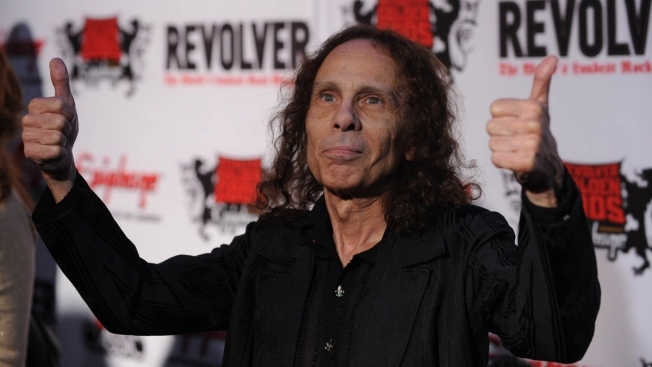 In this April 8, 2010, file photo, Ronnie James Dio arrives at the Revolver Golden Gods Awards in Los Angeles, California. A hologram of Dio will go on tour, starting in November. Late heavy metal icon Ronnie James Dio is set to tour again in hologram form. Rolling Stone reports the "Dio Returns" world tour kicks off in Helsinki on Nov. 30 and comes to the U.S. in the spring. Dio's widow, Wendy, says the hologram "gives the fans that saw Ronnie perform an opportunity to see him again and new fans that never got to see him a chance to see him for the first time." Dio died of stomach cancer in 2010 at the age of 67. In addition to his self-titled band, Dio fronted Black Sabbath for a time. Dio isn't the first dead performer to return to the stage as a hologram. Holograms of Michael Jackson, Tupac Shakur and Eazy-E have been showcased in recent years.